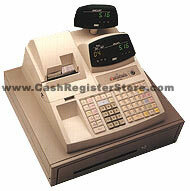 TEC MA-516 Electronic Cash Registers at Cash Register Store. PRODUCT DISCONTINUED. SUPPLIES STILL AVAILABLE! The TEC MA-516 is an advanced, full-featured cash register that is also affordable. It provides high levels of cashier convenience, increased speed, improved accuracy, added productivity and extended reliability. Modern styling and a compact low-profile design make the TEC MA-516 ideal for a wide variety of retail applications. The TEC MA-516 cash register comes equipped standard with a 5 bill/5 coin removable till metal cash drawer with a media slot for sliding into the cash register large bills, checks, etc. without having to open the drawer. Recommended as a entry level cash register for a grocery store, the TEC MA-516 cash register accepts coupon transactions and foodstamps. 6 payment: cash, check, etc.